Thirty new police cadets graduated from the Washington State Criminal Justice Training Commission’s Basic Law Enforcement Academy (BLEA) on March 15, officially becoming police officers. The graduating class, known as class 763, consisted of recruits from numerous police departments across the state. 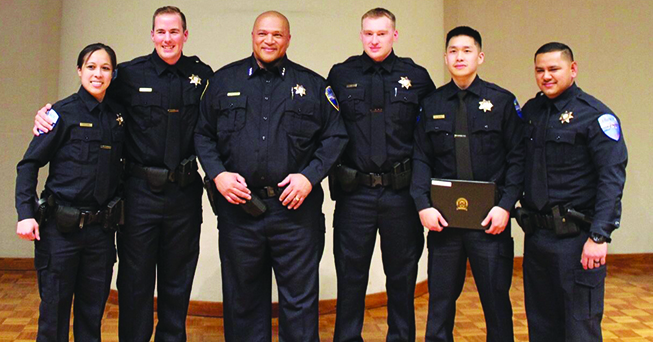 Among the graduates of class 763, were Officers Aissa Kline, Frankie Fernandez, Forrest Hutter, Haison Doung and Alexander Nelson of the Tulalip Police Department (TPD). The training is a 720-hour, twenty-week course, which takes place at the BLEA campus in Burien. During the course, recruits learn about criminal law and procedures, traffic enforcement, cultural awareness, communication skills, emergency vehicle operations, firearms, crisis intervention, patrol procedures, criminal investigations and defensive tactics to provide safe and effective law enforcement services. TPD had the largest number of recruits in the graduating class and are expecting even more graduates in upcoming months from both the BLEA as well as an academy in New Mexico. 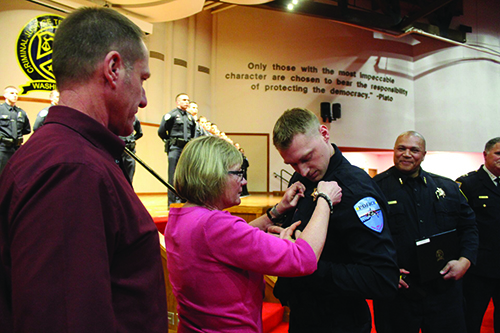 The TPD graduates received their certificates from Interim Tulalip Police Chief Sherman Pruitt and their families had the honor of presenting and pinning the official TPD badges. For more information, including how to become an officer at TPD, please contact (360) 716-4608.